The Kingaroy Clay Target Club will be holding the second (and final) day of their annual Two Day Shoot at the clay target shooting grounds in Goodger Road, Kingaroy, opposite Kingaroy Airport, from 9:00am this morning. Today's Shoot will have three main events: a 30TGT Points Score Championship; a 30TGT Handicap with a $1000 first prize; and a 15 Pair Double Rise. Spectators are very welcome, and there'll be a breakfast available at 7:00am. More details? Phone Cameron on 0408-064-535 or Peter on 0427-256-197. South Burnett entertainer James Harrison will be performing at the Palace Hotel in Drayton Street, Nanango from 2:00pm until around 5:00pm this afternoon for a relaxed Sunday sesh. Admission is free and everyone is welcome. More details? Phone Beau at the pub on (07) 4163-1287. The Kumbia and District Historical Society's museum, located in the Federation Heritage Centre behind Kumbia Hall in Bell Street, will be open from 1:30pm to 3:30pm this afternoon. The museum contains an excellent photographic display of local history and is well worth a visit. More details? Phone Josie on (07) 4164-4384 or Gayle on (07) 4164-4175. The Country Music Friends will be holding their first Sunday of the month informal concert at the Yarraman Community Hall in Browne Street from 1:00pm this afternoon. New players are very welcome and you can obtain more details by phoning Jenny on (07) 4163-2469. The Blackbutt-Yarraman QCWA will be holding their first Thursday monthly meeting at the Blackbutt RSL at the corner of Douglas and Muir Streets, Blackbutt at 9:30am this morning. New members and visitors are always very welcome. The South Burnett Cake Decorating Association will be holding their monthly meeting in The Studio at the Wondai Regional Art Gallery on the roundabout in Wondai from 9:30am to around 1:30pm today. Anyone with an interest in learning more about this fascinating art is very welcome. More details? Phone Gloria on (07) 4168-1952 or send her an email. The Wondaib AP&I Society will be holding their Annual General Meeting at the Wondai Diggers Club in Mackenzie Street, Wondai at 7:30pm tonight. All members are welcome to attend. The Blackbutt & Benarkin Aged Care Association will be holding its first Thursday of the month meeting at the Blackbutt Medical Centre at 91 Coulson Street in Blackbutt from 6:00pm to around 8:00pm this evening. New members are very welcome! More details? Email secretary Tracey Snell or phone Jeff Connor on 0448-946-702. The Nanango Garden Club will be holding their regular first Thursday of the month meeting at 10:00am this morning at a property in the Nanango area. New members are always very welcome. More details? More details? Phone Susan on (07) 4171-0619 or send her an email. The Yarraman Progress Association - which represents the interests of the Yarraman community - will be holding its regular first Thursday monthly meeting at the Yarraman Community Hall in Browne Street at 6:00pm this evening. New members are always welcome. The Kingaroy Red Ants will be holding their 2019 Sign-On Day at their clubhouse at T.J. O'Neill Oval in Youngman Street, Kingaroy (opposite the Showgrounds) from 4:00pm to 6:00pm this afternoon. New players are very welcome, but will need to bring along a copy of their birth certificate. A gold coin donation sausage sizzle will also be running. Nanango RSL in Henry Street, Nanango will be marking Chinese New Year with Chinese cuisine tonight. The RSL will be offering a choice of four Chinese dinners for $12.50 per plate (Fried Rice, Sweet and Sour Pork, Beef and Blackbean or Lemon Chicken) from 5:30pm onwards to help celebrate the Year of the Pig in addition to their usual menu. Bookings aren't strictly necessary, but you can phone the RSL on (07) 4163-1375 if you want to be absolutely certain of a seat. Today is the last day you can register for the free BOM Climate & Weather Workshop being held at Gayndah next Wednesday, February 13 (see entry that day for all details). A Community Afternoon with visiting players from this Saturday's Legends Of League sports day will be held at the Cherbourg Sports Centre in Collins Road, Cherbourg from 4:00pm to 7:00pm. There'll be a BBQ and free giveaways on offer, as well as the chance to meet players from both teams and grab autographs. Everyone is welcome! As a curtain-raiser for tomorrow's Legends Of League gala rugby league day in Cherbourg, the Murgon Business and Development Association will be holding a Sporting Memorabilia Auction at the Royal Hotel in Lamb Street, Murgon that kicks off at 6:30pm tonight. Items up for bids include a signed Cowboys football from 2015 Premiership winning year; a Women in League jersey signed by Gavin Cooper; a 1980 State Of Origin jersey signed by Wally Lewis, Gordon Tallis, Gene Miles, Allan Langer and Mal Meninga; a football signed by the entire Parramatta premiership winning sides of ‘81/’82/’83; a clock signed by Former Origin Greats, including Arthur Beetson; a framed Queensland Maroons 8 Straight featuring signed collector cards and many more. There'll also be a multi-draw raffle, and proceeds will go to assist Murgon and district projects. Everyone is welcome! Popular local entertainer Rob Fitz-Herbert will be performing at the Commercial Hotel at the corner of Glendon and Haly Streets, Kingaroy from 7:30pm until around 9:30pm tonight, followed by DJdirex who'll be spinning the platters until late. Admission is free. More details from the hotel on (07) 4162-1380. After a brief break for the festive season, the Grand Hotel on the Bunya Highway at Wooroolin will be holding their first Karaoke Night for 2019 with Love 2 Sing Karaoke from 7:00pm until late this evening. Everyone is welcome to this fun night out and there's no charge to take part. More details? Phone the hotel on (07) 4164-2261. The Kingaroy branch of the QCWA will be holding their regular second Friday of the month meeting at the QCWA Rooms in Kingaroy Street, Kingaroy (just next to Kingaroy RSL) from 9:30am to around 12:00 noon this morning. The day will kick off with coffee and chats - the meeting itself starts at 10:00am - and visitors and potential new members are always very welcome. More details? Phone Lois on 0407-965-094. The quarterly South Burnett Unpacked tourism industry networking meeting will be held at the Murgon Services Club in Lamb Street, Murgon from 10:00am to 3:00pm today. Today's meeting will focus on the up-coming 2019 tourism season (which starts towards the end of this month and runs through to mid-October) and related matters. All tourism operators are welcome to attend, and lunch will be provided to those who RSVP by email by February 1. The Kingaroy Junior Motorcycle Speedway Club will be holding a Come & Try day on the main oval of Kingaroy Showgrounds in Youngman Street, Kingaroy from 9:00am to 11:00am today. Young riders aged 4 to 16 will be able to come and try their hand at no cost under the supervision of an experienced team of officials and volunteers. And any participant at the Come & Try will be eligible to claim a free Recreational Motorcycling Australia Licence (valued at $130) just for participating. This licence lasts for 12 months, and insures riders for participating in the sport, offering them more access to motorcycle venues, events and resources. More details? Tracey on 0407-623-012. You can also read more about today's activities on our website. The South Burnett Regional Council will be holding a workshop for Kingaroy and district businesses who'd like to be included in the Council's Preferred Supplier list for trade services, electrical services and pest management services. The workshop will explain how to go about it, and will be held at the Kingaroy Town Hall Reception Room in Glendon Street from 5:00pm to 7:00pm this evening. St John's Lutheran School P&F will be meeting in the school's office meeting room in Ivy Street, Kingaroy at 7:00pm tonight to discuss developments at the school and plans for this year's 30th anniversary celebrations. All interested people are welcome to attend. More details? Phone the school on (07) 4162-3988. The Heritage House committee will be holding their 2nd Monday of the month meeting at Heritage House in Millar Street, Yarraman at 6:00pm this evening. New members are always welcome. More details? Phone (07) 4163-8111. The AFL's Auskick program for children aged 5 and over will be holding a Come & Try session at Lyle Vidler Oval in Youngman Street, Kingaroy (just next to Beangrowers) from 5:00pm to 6:00pm this afternoon. Youngsters who'd like to sign up to this 8-week program will require an $80 registration fee, but today's session is entirely free. Members of the Brisbane Lions will also visiting today, and will be happy to sign autographs and pose for photos. The Blackbutt Busy Needles group will be meeting at the Uniting Church Hall in Coulson Street, Blackbutt from 9:30am to 1:30pm today. The group meets every 2nd and 4th Wednesday and new members are always welcome. More details? Phone Linda on (07) 4170-0823 or Sue on (07) 4163-0919. Nanango's Probus Club will be holding their monthly meeting at the QCWA Rooms in Fitzroy Street, Nanango (just across the road from IGA) from 9:30am to 11:30am this morning. The club meets on the second Wednesday of each month except January, and all meetings usually feature a guest speaker who talks on an interesting topic. Afterwards, some members like to go for a meal at a local venue, and newcomers are always welcome. More details? Phone Rosie on (07) 4163-8930 or send an email. The Booie Hall Association will be holding their Annual General Meeting in Booie Hall at 1867 Booie Road, Booie at 7:00pm this evening. All interested people are welcome to attend. The Queensland Farmers’ Federation, AgForce Queensland, the Bureau of Meteorology (BOM) and the Department of Agriculture and Fisheries (DAF) will be holding a one-off climate and weather workshop for primary producers at Gayndah's Grand Hotel in Meson Street from 8:30am to around 1:30pm today. BOM Senior Forecasters Rick Threlfal and Michelle Berry will discuss the process of weather forecasting and what it means for primary producers; demonstrate the use of the models and tools available on BOM's website; and explain how to access climate and weather information. After this, DAF Senior Extension Officer Damien O’Sullivan will explain how to understand long-term climate forecasts, what to look for and how to understand some of Queensland climate drivers, as well as what to expect for the season ahead. Lunch will be provided at this free workshop, but to help plan the catering an RSVP by February 8 is required. Registrations can be made on EventBrite. The Kumbia QCWA Craft Group will be holding their regular 2nd Wednesday of the month meeting at the Kumbia QCWA Rooms in Bell Street today, kicking off with morning tea at 9:30am. Everyone is welcome, whether they're QCWA members or not. More details? Phone Mollie on (07) 4164-4191 or Lil on (07) 4164-4218. The Wondai Senior Citizens Club will be holding their second Wednesday of the month meeting at the Wondai Diggers Club at 87 Mackenzie Street, Wondai from 1:00pm this afternoon. The $2 meeting fee includes afternoon tea, a singalong, card games, bingo and beatles with small prizes, and membership is only $5 a year. The club also organises occasional bus trips. New members are always welcome, and you can obtain more details by phoning Graham on (07) 4168-5598. The Wooroolin QCWA will be holding their regular monthly meeting at the Wooroolin QCWA Rooms on the Bunya Highway, Wooroolin at 9:30am this morning. All interested women from Wooroolin and district are very welcome to join them for a great afternoon tea and a chat after the meeting. More details? Phone Janice on 0439-073-160. The second day of the three-day 2019 Brahmousin Cattle School will be held at the Nanango Showgrounds in Cairns Street all day today (and tomorrow). The school would be of interest to anyone interested in showing and judging cattle, and you can read more about it on the Cattle School website. Post-modern country funk band Horace And The Hayseeds will be performing at the licensed Scrubby Creek Bar next to the Bunyanut Cafe in Coulson Street, Blackbutt from 6:30pm until late tonight as part of their 2019 "Dancing On The Tables" tour. Admission is free and there'll be a lucky door prize as well. More details? Phone the cafe on (07) 4163-0375. Popular entertainer Elay will be performing at the Kingaroy Hotel-Motel at the corner of Youngman and Haly Streets in Kingaroy from 8:00pm until late tonight. Admission is free. More details from the hotel on (07) 4162-1677. Well-known South Burnett entertainer Natalie Fenton will be performing at the Nanango RSL in Henry Street, Nanango from 6:00pm to 8:00pm this evening. Admission is free. More details from the RSL on (07) 4163-1375. Entertainer John Koehle will be performing at the Kingaroy RSL in Markwell Street, Kingaroy from 7:30pm until around 11:30pm tonight. Admission is free. More details from the RSL on (07) 4162-1755. Popular solo performer Alex The Frenchman will be playing at the Palace Hotel in Drayton Street, Nanango from 7:30pm until late tonight. Admission is free and everyone is welcome. More details? Phone the Palace on (07) 4163-1287. The 11th annual Reef & Beef Extravaganza will be held at Ironpot Hall in Jarail Road, Ironpot from 5:30pm onwards this evening. This all-you-can-eat event will offer guests as many prawns, oysters, Moreton Bay bugs, scallops, whole cooked Red Emperor and pan-fried reef fish fillets, rib steaks and BBQ rib fillet steaks as they can pack in, along with salads, vegies and dessert. There'll also be a licensed bar operating too - so no BYO - plus live entertainment from local performers. It's been a year since Ironpot last digested a Reef & Beef Night but it'll be a fantastic event (as it always is). And if you'd rather be driven than drive the 55km from town, there'll be a bus running from Kingaroy's Glendon Street bus depot at 4:30pm for a small extra $10 fee. Reef & Beef tickets are $80 per head for adults, $50 for high school students and $25 for primary school students and you can book them by phoning Sonya on 0428-648-142 or Hook on 0428-648-244, or by emailing them. Be quick, though! Numbers for this popular community fund-raiser have risen every year and places are limited. The South Burnett Pantry will be holding a Garage Sale outside their premises at 22 Stolzenberg Road, Kingaroy from 7:00am this morning. The sale will be offering furniture, eskys, clothes and bric-a-brac at bargain prices, and all proceeds will go to aid the Pantry's ongoing welfare work in the community. The third Saturday of the month Friendship Markets will be held at the River Road end of the Kingaroy Showgrounds in Youngman Street, Kingaroy from 7:00am to around 12:00pm today. The markets are jointly run by the Kingaroy Rotary Club and Kingaroy Show Society and feature a great range of arts, crafts, fruit and gvarden stalls, plus unusual bric-a-brac. New stallholders are always very welcome! More details? Phone Wayne on 0432-355-166. Note: Today's markets are in a new location to take advantage of shade, toilets and power outlets - they were formerly at the Cheers Triangle end. 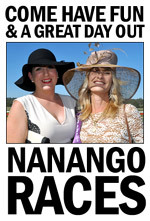 The Nanango Race Club will be holding their first race meeting for 2019 at the Lee Park Raceway off the D'Aguilar Highway just south of Nanango from 11:00am to around 5:00pm today. Today's races will have a "Pinkl, Pink And More Pink" theme and everyone is encouraged to dress up in their best pink outfits or accessories to be in the running for some great Moffatdale Ridge Fashions Of The Field prizes. The race club's popular [email protected] Bit Bar will be serving up platters all day if you fancy a bite; a licensed bar and BBQ will be operating under the extended covered area; the race club canteen will be open for sit-down dining; children will be well catered for with face-painting and ice creams; and there'll be plenty of bookmakers and an on-course tote available in the betting ring to take your wagers. A lot of people like to use the February meeting for picnics on the lawns, and you're welcome to bring your own marquee if you like. This will be a 5 race meeting and buses will be running to the races from Kingaroy's Glendon Street Bus Depot (12:00 noon) and the Fitzroy Hotel at 12:20pm. The first race will leave the barriers around 1:20pm but gates will open at 11:00am so go-getters can get a head start on that all-important socialising. Admission is just $10 for adults and $5 for pensioners (under-15s are free). Everyone is welcome! More details? Phone Rosemary on (07) 4163-2346 or email her. There's no A-grade cricket being played in the region this weekend - the last round of the competition ahead of the finals is being played in Gympie - but there'll be four local B Grade matches. In Kingaroy, Kingaroy Services will play Warriors at Taabinga State School; in Nanango, Nanango will play the Kumbia Rattlers at the Nanango Sportsgrounds in Burnett Street; in Wondai, Wondai will play Blackbutt at the Wondai Sportsgrounds off the Bunya Highway north of the CBD; and in Murgon, Murgon District will play Cherbourg at Murgon State High School. All games start at 12:30pm and spectators are very welcome. The final day of the three-day 2019 Brahmousin Cattle School will be held at the Nanango Showgrounds in Cairns Street all day today. The school would be of interest to anyone interested in showing and judging cattle, and you can read more about it on the Cattle School website. The Blackbutt Golf Club at 51 Langton Road in Blackbutt will be holding its Men's Carnival today, sponsored by IGA Nanango. There'll be a double shotgun start at 8:00am and 12:30pm and green fees - which include a meal - are $22. Everyone is welcome! More details from the golf club on (07) 4163-0180. The Kingaroy branch of Native Plants Queensland will be holding a nature walk along Planted Creek and Goonuloom Road in Tansey at 9:00am this morning, kicking off with a morning tea. Native Plants Queensland focusses on the State's native plants, and the walk is open to members and non-members alike. However, to help plan the catering, an RSVP would be greatly appreciated. You can make one by phoning Jean on (07) 4168-7110. The Kingaroy & District Tennis Association will be holding a Social Tennis Day at their courts in Oliver Bond Street, Kingaroy from 3:00pm to 7:00pm this afternoon and evening. Participants should BYO racquet and a gold coin donation to take part, and drinks and a sausage sizzle will be available on site. Players of all skill levels are very welcome. A Chinese Brush Painting Workshop will be held at Studio 4 in Coulson Street, Blackbutt from 10:00am to 12:00 noon this morning. No prior skills or artistic talent are required, and the workshop is limited to a maximum of 10 people. Fees are $40 per person or $60 for a couple (children must be accompanied by an adult) and everyone is welcome. The South Burnett Rail Trail Users Association will be holding their first meeting for 2019 at The Studio next to the Wondai Regional Art Gallery in Haly Street, Wondai at 7:00pm tonight. The SBRTUA is a not-for-profit group dedicated to the ongoing improvement and development of the South Burnett Rail Trail, and all interested people are very welcome to attend. The Yarraman Business Group will be holding their regular third Tuesday monthly meeting at the Club Room in the Yarraman Caravan Park on the D'Aguilar Highway north of town at 6:15pm this evening. The group caters for Yarraman businesses and new members are very welcome. More details? Phone 0409-504-383. The Goodstart Early Learning Centre at 79-83 Ivy Street, Kingaroy will be holding an Open Day from 6:30am to 8:30am this morning so that parents looking for child care can run the ruler over the centre's facilities. More details? Phone the centre on (07) 4162-7122. The Totally & Permanently Disabled Soldiers Association will be holding their Annual General Meeting at Kingaroy RSL in Markwell Street, Kingaroy at 11:00am this morning. All interested people are welcome to attend. The Kingaroy Photographic Club will be holding its 3rd Tuesday of the month meeting inside Kingaroy State High School's Community Room from 6:30pm this evening (access is via the Markwell Street bus parking area). New members are always welcome. More details? Phone Rosemary on (07) 4162-3406. The Proston Over 50s Club will be holding their regular third Tuesday of the month meeting and social at the Proston Town Hall in Rodney Street from 10:00am onwards today. The $2 admission fee includes morning tea and there'll be a communal lunch at around noon (bring along a plate to share). Members take part in various games, lucky door prizes and progressive raffles, and membership is just $5 per year, with bus trips are organised throughout the year. New members are always welcome! More details? Phone Noela on (07) 4168-9296. The Kingaroy QCWA Twilight Branch will be holding their third Tuesday of the month meeting at the QCWA Rooms next to Kingaroy RSL in Kingaroy Street, Kingaroy from 6:00pm to around 8:00pm tonight. The Twilight Branch is a new branch of the QCWA specifically designed for working women and busy mums. It meets in the evenings and is separate from the traditional Kingaroy branch (which meets during the day). The Twilight Branch is open to all women who'd like to take part in QCWA activities and/or find out more about this highly respected community organisation. New members are always very welcome! More details? Phone Lois on 0407-965-094 or email her. You can also read more about the branch on this page of our website. A Murgon Fat & Store Cattle Sale will be held at the Murgon Saleyards on Gayndah Road in Murgon from 8:00am until around noon today. The fortnightly sale usually sees yardings of 700 or more cattle and buyers from all over the region. The second (and final) day of the 36th annual South Burnett Soccer Sevens will be held at the Kingaroy Soccer Grounds in Oliver Bond Street, Kingaroy today. This giant pre-season carnival - run by the South Burnett Senior Soccer Association - attracts teams from all over south-east Queensland and is one of the region's major annual sporting events. This year organisers expect there'll be upwards of 39 men's and women's teams competing for more prize monies, and locals are also very welcome to form a team and join in. Today's games will get underway at around 8:00am and will run to about 3:30pm, when presentations will be made to the winners in the Men's, Women's and Over-35s divisions. Admission to the Soccer Sevens is 100% free for spectators and there'll be a licensed bar, BBQ and canteen operating at the grounds too. The Hivesville Country Markets will be held at the Hivesville Sports Grounds from 7:00am to around 1:00pm today. These family friendly monthly markets are held on the 4th Sunday of every month and feature a variety of stalls including fresh local farm produce, plants, crafts and lots of food. There'll also be mini auctions running throughout the morning and there's plenty of free parking in the grounds. New stallholders are very welcome too, and you can obtain more details by phoning Trish on 0459-493-511. The Kingaroy Chamber of Commerce and Industry will be holding its regular six-weekly meet'n'greet for local businesspeople at 5:15pm this evening. Tonight's host is Wayne's World at 147 Haly Street, Kingaroy and founder Wayne Clark will be the evening's special guest speaker. Wayne and his wife opened their first store in Brisbane in 1997, their Kingaroy outlet in 2011, and they currently operate 11 stores across the two states. Other guest speakers include representatives from Tarong Power Station, Meandu Mine and the South Burnett Regional Council. Meeting fees are $10 per person - which includes nibbles and drinks - and the meeting is open to everyone, whether they're KCCI members or not. For catering purposes, though, an RSVP to [email protected] by February 24 would be greatly appreciated. Next Tuesday is Shrove Tuesday (probably now better known as International Pancake Day) and it heralds the beginning of fasting in Lent. According to historians Pancake Day had is origins in medieval times when feasts of pancakes were held to use up supplies of fat, butter and eggs because these foods were forbidden during Lent. But in Kingaroy, the Anglican Ladies Guild will be holding their traditional Pancake Day celebration a week early this year to avoid a clash with the Probus Club's AGM. The fun will run from 10:00am onwards this morning at the church's hall in Alford Street. Admission is a slim $2 and there'll be a morning tea, a lucky door prize, a raffle, pancake tossing, a mystery parcel, live entertainment and a bring and buy stall. Everyone is welcome! More details? Phone the church office on (07) 4162-1231. BIEDO will be holding a Small Business Roadshow to promote government agencies that provide assistance to small businesses at the Goomeri Hall of Memory in Goomeri from 5:30pm to 7:30pm this afternoon. Admission is free. More details? Phone BIEDO on 0400-695-456. The South Burnett Chorale will be holding their regular Tuesday practice night at the Church of Christ Hall at the corner of Haly and Burnett Streets in Kingaroy from 7:00pm to 9:00pm this evening. The Chorale meet every Tuesday night during school terms, and new members are always very welcome! More details? Phone Margie on 0424-924-632. Note: Tonight's meeting is also the group's AGM. The QCWA Kumbia Branch in Bell Street will be opening its doors at 9.00am this morning for a cuppa, followed by its monthly branch meeting at 9:30am. After this formality has been attended to, though, members focus on friendship and fun through sharing their skills in traditional and contemporary art and handcraft activities for the remainder of the morning and into the afternoon. Members, non-members and new members are all very welcome! More details? Phone Catherine Woodham on 0403-616-564. BIEDO will be holding two Small Business Roadshows to promote government agencies that provide assistance to small businesses today. The first will be held at Wondai Town Hall in Mackenzie Street, Wondai from 6:30am to 8:30am this morning; and the second will be held at the Blackbutt Memorial Hall in Bowman Road, Blackbutt from 5:30pm to 7:30pm this evening. Admission is free. More details? Phone BIEDO on 0400-695-456. The Roy Emerson Museum at the end of Hart Street in Blackbutt will be hosting Wednesday afternoon board games from 2:00pm to around 4:00pm today. There'll be a big range of popular board games on offer, but guests are welcome to bring their own if they wish. Playing fees are just $2, which includes afternoon tea or coffee (BYO mug), and everyone is welcome! More details? Phone Jackie on 0438-785-009. The Kingaroy Men's Shed in the old Motor Pool building off Geoff Raph Drive at Kingaroy Airport will be holding their Annual General Meeting at 9:00am this morning. All interested people are welcome to attend. The South Burnett Junior Motorcycle Club will be holding its AGM followed by its regular monthly meeting from 7:00pm tonight on the top deck at the Carrollee Hotel in King Street, Kingaroy. All committee positions will be declared vacant. An AFA South Burnett Schools Futsal competition will be run at the Kingaroy State High School Sports Hall in Markwell Street, Kingaroy from 3:45pm to 5:30pm this afternoon. The games are for players aged 6-17 and are run by National Futsal Coach Debbie Ovens. Playing fees are c$5 and new players are most welcome. More details? Phone Debbie on 0413-300-648. The Goomeri Library at 5 Moore Street, Goomeri will be holding a free Tech Savvy Seniors session from 2:00pm? to 4:00pm this afternoon, looking at the basics of using EBay and Gumtree to buy and sell goods online. More details? Phone the library on (07) 4168-4340. The Murgon Local Ambulance Committee will be meeting at 41 Lamb Street in Murgon at 7:00pm this evening. Potential new members are very welcome. An Arts Forum to discuss future directions for the arts in the South Burnett will be held at The Studio next to the Wondai Regional Art Gallery on the roundabout at Wondai at 4:30pm this afternoon. This forum is being arranged by the South Burnett Regional Council as a follow-up to an initial forum held in Kingaroy last December (you can read about that forum on our website) and all people interested in the future growth and development of the arts are invited to attend. The Ballogie Community Group will be playing Hoy at the Murgon Motor Inn on the Bunya Highway, Murgon from 1:30pm onwards this afternoon. It costs $5 to play and there'll be a $1 afternoon tea and $1 raffle tickets available. The Hoy group meets on the 4th Thursday of each month and new players are very welcome. More details? Phone (07) 4164-1249 or 0448-289-403.